This page has been created to be used as a guide for the historic official public launch of EFF, which will be happening this coming Sunday, the 13th of October 2013. Fighters are requested to Post Directions/Travel information and related details to help those who will be going to Marikana! Transport to Marikana From Thulamela Region, Limpopo Province, Venda (Thohoyandou and Surrounding Areas) It is R250. Please Call Madula Sadiki on 0725825630. Even when you are not from Thulamela and you need transport, they can accommodate you. Be part of this historical day. We are here in Marikana to Mark the official Birth of the TRUE REVOLUTION, for those who are not at Marikana …..know that the revolution will not be televised. will come. Adapt, change and evolve, but never, never quit. 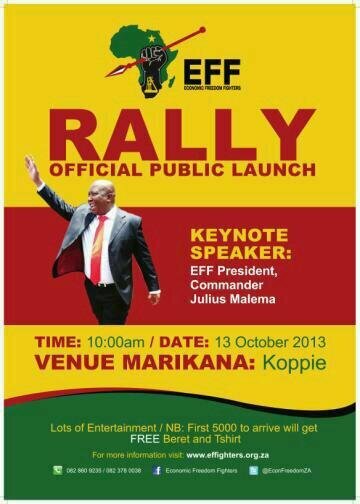 Viva fighters viva may God guide and protect all of you during this launch on Sunday. Whats the transport from carletonville to marikana? I think you must include list of branches and contact details of them on the web even if can be a contact person for the branch. At the end of every struggle victory is certain,today not only history is made an ernomous giant is put into parade to heal our proken hearts.God’s will is like his purpose and EFF struggle shal come to pass.A new revelation deserving to be chaptered in our children educational books of history is finally here.Viva fighters viva! May you please shower all the fighters with the double portions of victorius strength to move the South African motionless wagon under zANC to prosperity and greener pastures. We know this is a new birth of our economic freedom in our life,prophecied by fighter and commander in chief,Sello Julius Malema,a revelationist of all revelations. Words cannot thank you for bringing the fihgter in me and all other South Africans to realise the possibility to live. God is with us fighters,this victory is an assurence that we are the government in waiting.Asi’jiki. Victory was witnessed and fighters were made to feel like kings and queens as the giant was officially launched. Hope is not about what you have,in our lifetime hope is about change and only EFF will make this change everlasting without fear or favour. Economic Freedom Fighters welcomes the ruling of the Johannesburg High Court that the mineworkers who survived the Marikana massacre last year and the families of those who died must receive legal funding from the state for the Farlam Inquiry. We have said long ago that the state must cover the costs of the entire commission as it will assist in the speedy processing of truth and justice for victims. The ruling provides a legal basis for government to act, if not from a moral conscience, then from a legal conscience. We therefore call on the state not to appeal the ruling, thus delaying the search for truth and justice. It is in the best interest of the public that through tax payer’s money, government must fund the workers and their families’ legal costs as it acted in killing them, in the name of the republic. The truth about Marikana and justice for the victims will indeed serve a great benefit to the pain that the massacre has caused to victims, but also to the nation as a whole. The matter must not be stretched any further so that the country can close the legal chapter of the brutal mass murder of workers in Marikana. Land must come back to the people,South africa is for south africans.Viva EFF VIVA!!!!!!!!!!!!!!!!!!!!!!!!!!! eff is eff and will be eff ‘sale e fitla palamenteng zuma ge a tshaisa o gorogela ngakeng ya sekgowa.even if they pretend like they disagree with us personally they agree with us. Zuma agree that is too old to work for goverment and mus go and rest in peace in the home country that he steel from it. eff is eff and will be eff ‘sale e fitla palamenteng zuma ge a tshaisa o gorogela ngakeng ya sekgowa.even if they pretend like they disagree with us personally they agree with us. Zuma mus agree that is too old to work for our goverment and mus go and rest in peace in his home country that he steel from it.we won kill him because we can see his day are num…. Greetings Fighters My Name is Robert I m from Ward 40, we have a serious problem in our ward that need serous attention from our senior Fighter, Please help we don’t need to be separate in this ward even to loose this ward. as an EFF we are standing and saying Ekurhuleni Belongs to EFF, please help.